Anyway, this is a small race and not long after the whistle was blown, I crossed the start line. Some guy next to me was running barefoot. Like totally barefoot. For the first two miles I experienced a new-to me pain. My left shin felt like someone was beating it with a wooden stick. All of my injuries have been on my right leg, so this was a nice change. I stopped a few times to try to shake it off but nothing really helped. I told myself to go just a little further and see if it went away, otherwise I was sure I would need to stop. I peeled down my compression sock on my left side to give my shin some breathing room. By mile 3 the pain was gone. Lots of love to our friends and family who captured these shots of me, Matt and Jon. This was the first half marathon I’ve run but didn’t race. I didn’t want to go all out because I’m trying to closely follow my training plan and this was meant to be a down week. More than that, I didn’t train for a half. I’m training for a full marathon. And I wanted to be able to get back to big runs this week without any time off for recovery. Still, it was a weird challenge mentally to know I wouldn’t be even trying to beat my own PR (set at the Brooklyn Half in 2015). The course takes you through gorgeous houses guarded by thick hedges. At a few turns you can glimpse the ocean and for a very short stretch, run right by it. Holding some Huma Chia Gu. Delicious enough to slowly nurse for miles! My goal was to run at an average pace of 9:30min per mile and that’s exactly what I did. Though it was not easy. The race setting changed my expectations from “just run easy” to constantly questioning whether I should push harder. Either way, I’m pleased as punch to have 13 miles in the books. I’m not usually one for a post-race ice bath, but when in Rome. 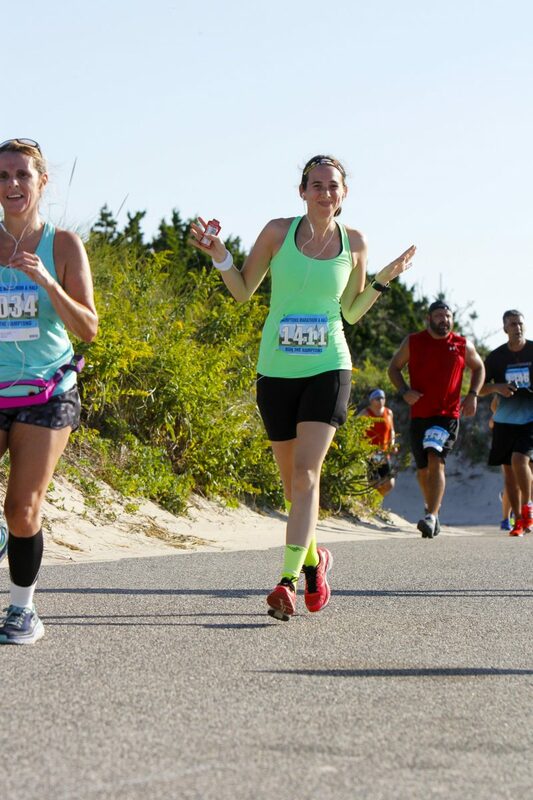 One of the best things about this race is the great pre-race hype up from the Run the Hamptons team. They offer group runs and lots of motivation in the months leading up to race weekend. You should check them out here. Plus, their medals and loot couldn’t be cuter. Did you run a race this weekend? 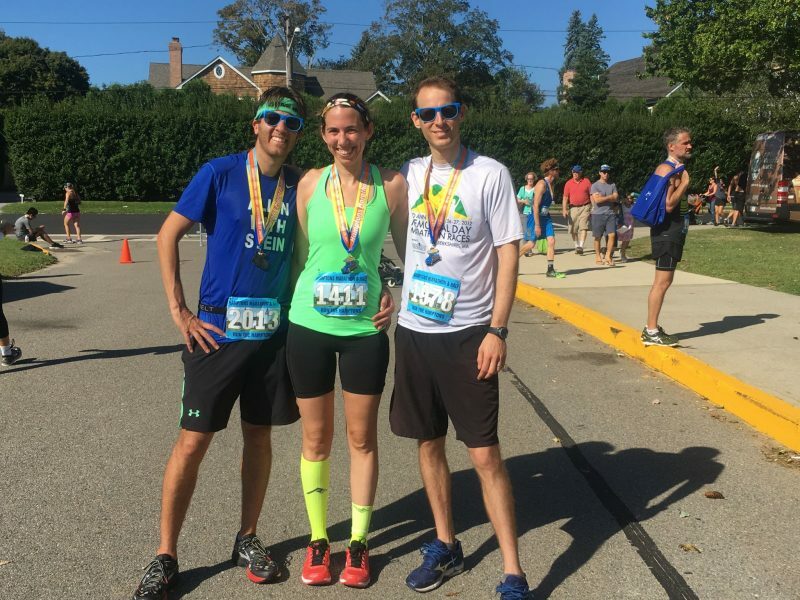 Do you run races when training for a marathon? 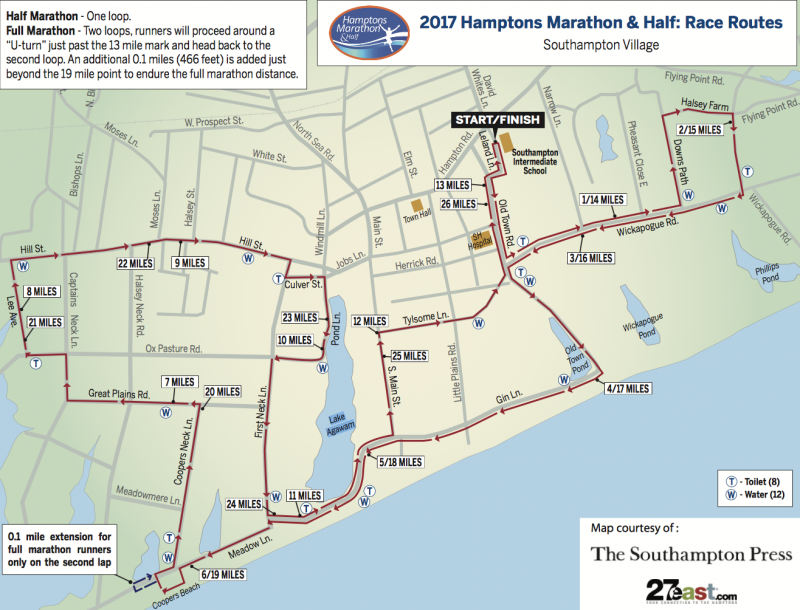 Awwww the Hamptons Half <3 I haven't done it since they moved the course to Southampton, it looks like you had a great time! Good luck with the rest of your training! Hey well done, it was a good run in the sunshine. Probably too much sunshine! What a lovely town. 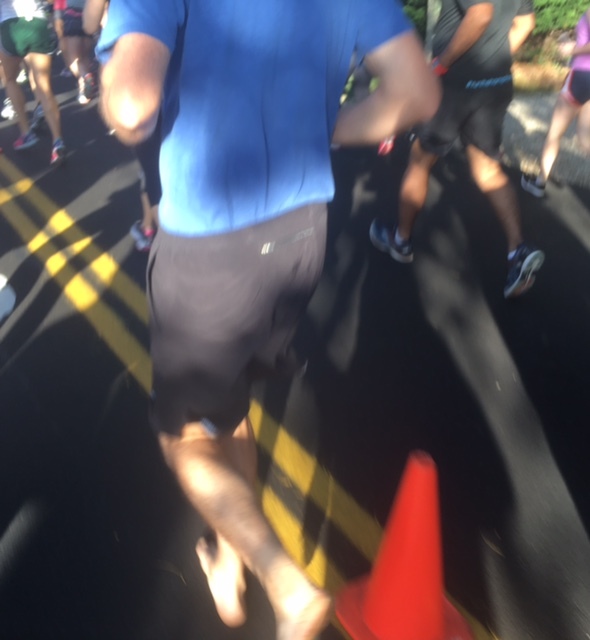 The guy next to you running barefoot. ahhhh! you found me!! how was your race? 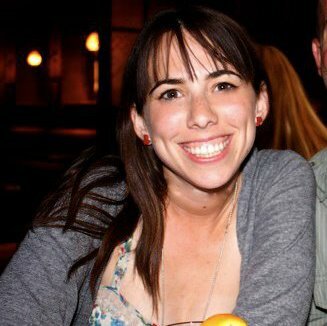 can you tell me about the barefoot running? doesn’t it hurt??? haha yeah. I enjoyed the run but it was a lot hotter than I am used to (I am from England). I was a slower than normal because of that, but hey ho. It doesn’t hurt generally, as long as you land correctly. You have to bend your knees and land on the front of the foot, and kind of try to be as quiet as you can, that’s how you know if you’re doing it right. If you can hear your feet land then you have to lighten it up. Having said that, between the 24 and 25 signs the road surface on S Main Street was very rough so that got quite emotional! I knew it was coming, because I remembered it on the first lap. I got through it somehow and was very glad to have an ice cream afterwards. that’s the most well deserved ice cream i’ve ever heard of. congrats on your race!!! Thanks, you too!! Hopefully I can get back in the NYC marathon for 2018.